After uploading the product on Houzz.com or after updating the product inventory or the product price, the user can check the status of the feed from the Houzz Feed Details page. 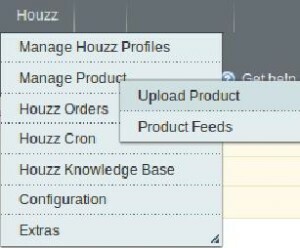 On the top navigation bar, move the cursor over the Houzz menu and then point to the Manage Product menu. View the status of the feed in the Feed Status column. To synchronize the feeds between Sears and Magento, click the Sync Feeds button. Select the checkbox associated with the required product and submit the Sync Feeds action. To delete the feed, select the check box associated with the product and submit the Delete Feeds action. To view the product feed error, click the Error button or to view the details of the feed, click the button. Note: If the feed detail is not available, then the button appears. To download the Feed File, click the Download link appearing in the Feed File column.